What horrible weather. I had both days free and the plan was to put up my greenhouse. Cue high winds and horizontal rain. In a brief lull the culticave went up as a temporary sanctuary and my peas and onions are tucked up inside. Slugs are already trying to take over. I left my pots of peas outside for a week and there were at least 2 small slugs sitting just under the surface in each. They are ex-slugs. Also cut down the kale – the flowering tops came home for tea and the rest went in the dalek, chopped up small to aid speedy decomposing. Turned over part of the bed, but stopped when it got too claggy and the drizzle/wind got more determined. Also managed to sort out the manure bin – the heath robinson-style cover is leaky and it was full of very brown (smelly) water as well as manure. Anyways, since I can’t do anything more on the plot I’m having an evening of seed sowing, as the greenhouse WILL go up sometime soon. Here come the tomatoes! And just to put a little more pressure on myself, I’ve thrown my growing plan to the many winds and sown some squashes. Some in the propagator, some not, just to see the difference in germination. In a moment of unnatural tidiness I’ve also sorted out my booze infusions, which are stored under the bed in big kilners. 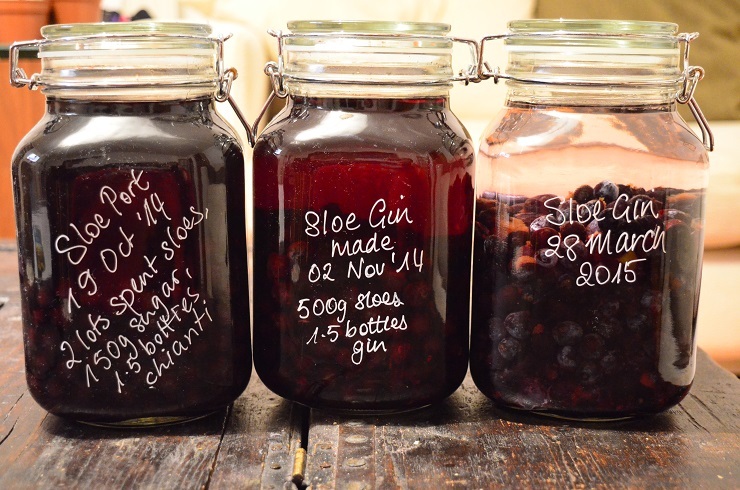 I made the last batch of sloe gin with frozen berries yesterday and am decanting the first stage of sloe port ready to mix with a little cognac and leave for another few months – though it is very good to drink now. Just for tasting purposes you understand!